Religious tattoos have been around for thousands of years. Although tattoos are prohibited by some religions, for others they're a way to express devotion. 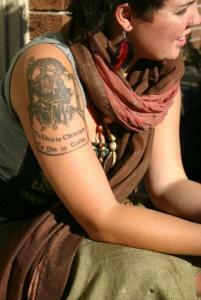 Many cultures use tattoos to signify status, mark adulthood or commune with gods and spirits. 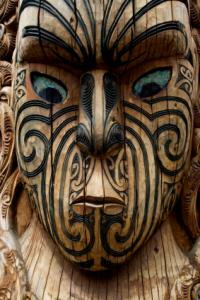 Among some Polynesian groups, special tattoos are said to bring magical protection in battle. The Dayak people of Borneo, for example, use tattoos to ward off evil spirits. Archeologists have found numerous mummies from many different cultures with complex tattoos. Although the exact meanings of the tattoos can't be known, some are thought to have religious significance. Religious tattoos have different meanings in different religious traditions. Further, some spiritual traditions, such as some schools of Judaism have prohibitions against tattoos. Research what your faith has to say about tattoos before getting inked. Christian symbols in tattoos aren't a new idea. Soldiers in the Crusades were supposedly tattooed with small crosses, a symbol they wished for a Christian burial. According to the Australian Museum, in 1862, England's Prince of Wales got a tattoo of a Jerusalem Cross after visiting the Holy Land. But with the recent explosion in the popularity of tattoos, more and more people are choosing tattoos that reflect their Christian religious beliefs. 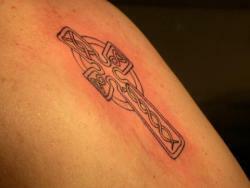 There are abundant web sites with information about and examples of Christian religious tattoos. ReligiousTattoos.net has hundreds of pictures of religious tattoos, sorted by type. You'll find crosses, praying hands, saints, angels, biblical animals, and more. The site also offers a brief history of religious tattooing, information about Christian views on body art, and some helpful links. Photo submissions are welcome. Alliance of Christian Tattooers is a community of Christians who are devoted to tattoo art. In addition to a photo gallery, the page shows events (non-Christian but tattoo related), a store as well as Christian-owed studios. The ACT also has a Facebook page where they offer daily devotionals, prayers, etc. Some of the more general tattoo sites include photo galleries of Christian tattoos. Two of the big ones are Tattoo Design and BMEzine. Be warned these sites also contain explicit images of body modification and other types of tattoos, including images that may be offensive to some people. Buddhist imagery is a popular tattoo choice. Find some examples at LuckyFishArt.com. If you're not a practicing Buddhist, it's a good idea to do careful research before choosing a Buddhist tattoo design. Make sure you understand what the symbol means; if it includes any lettering in a language you don't speak, find out the translation and ask a native speaker to verify it. There is a biblical passage that seems to forbid tattoos for both Jewish and Christian believers. Leviticus 19:28 states: "You shall not make any cuts in your body for the dead nor make any tattoo marks on yourselves." Observant Jews believe that any body modification, including tattoos, is forbidden. However, tattoo fans choose to interpret this sentence differently. They believe that it was part of a general prohibition against adopting the practices of other religions. Under this interpretation, the modern practice of tattooing, which is done for ornamental purposes, isn't prohibited. Islam prohibits making alterations to the body to enhance beauty, and many Muslim leaders feel strongly that this includes tattoos. A few religious leaders find tattoos acceptable, but in most cases they are considered haram, or forbidden. Some less observant Muslims see nothing wrong with getting a tattoo; as with all religions, different people interpret the requirements differently. You have to make the ultimate call as to whether or not tattoos are part of your spiritual path. Once you have done this, take careful consideration to ensure you get the right tattoo. Remember you are always an ambassador of your faith. This is even more true when you get a tattoo expressing your faith, as you are constantly representing your religion on your body. If you are comfortable with the ramifications of this, and believe you can represent your faith in a positive light, there is no reason you shouldn't adorn your body with your belief.